Heat olive oil in a large saucepan over medium-high heat. Stir in onions and garlic, cook until the onion has softened and turned translucent. Pour in tomatoes, garbanzo beans, and water; season with paprika, red pepper flakes, salt, and pepper. Stir in carrots and potatoes, then place chicken thighs skin-side up on top of the vegetables. Bring to a boil over high heat, then reduce heat to medium, cover, and simmer until the chicken is tender, about 25 minutes. 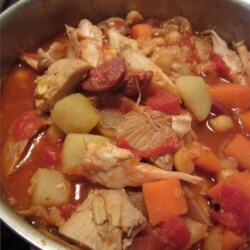 Remove chicken from the stew and set aside. Stir in the chorizo slices, then pour the stew into a glass baking dish. Place the chicken thighs on top, skin-side up. Bake in preheated oven until the stew has thickened and the chicken skin is crispy, about 15 minutes.